THE CHIEF EXECUTIVE of AIB has said most of the 9,348 customers who were impacted by the tracker mortgage scandal will have been compensated by his bank by March this year. Bernard Byrne today appeared before the Oireachtas Finance Committee, which is investigating how this overcharging occurred and demanding regular updates from the offending lenders. The scandal saw more than 30,000 customers of the country’s banks being overcharged by their lenders when they were either denied a tracker rate they were entitled to, or charged a higher rate of interest on their mortgage. In many cases, the over charging ran into tens of thousands of euro – in the worse cases people lost their homes as a direct result of the bank’s action. Byrne is the first of the bank bosses to appear before the committee in 2018 and he again apologised for his bank’s failures. He told members that the public and political criticism of the bank’s handling of the matter had been understandable. A total of 14 AIB customers who were impacted by the bank’s decisions around tracker mortgages lost their homes. All of these have been compensated, according to the CEO, but two of the account holders have launched appeals against the amount of compensation given, according to RTÉ News. Byrne explained that after the economic crash, the bank decided it would no longer make tracker mortgages available to new customers. The unforeseen and unintended consequence of this decision was that certain customers, who held a tracker product at some point previously, but had already moved off the tracker product prior to this decision, were not able to revert to the tracker product. It is clear that the potential fallout of the decision to stop offering the tracker product to new customers was not considered in terms of how existing customers might be impacted in the future as some of these customers had a right to revert to a tracker. This clearly should not have happened. Byrne said the difficulty was compounded by “limited legacy IT systems and operational failures” in AIB, and EBS when it merged with AIB in 2011. “The systems did not record the banks proper commitments and obligations to its customers. While the failure to consider the impact on customers was not deliberate, it is a failure that should not have happened and we apologise for this,” he said. Byrne also said that where a small number of complaints about this issue did occur, legal advice and the initial outcome of cases to the Financial Services Ombudsman supported the bank’s decision. “With the benefit of hindsight this was too bank-centred,” he said. Byrne gave an update to committee members on the bank’s progress in paying customers back and compensating them. With a team of 500 staff working on identifying impacted customers, the bank has analysed 650,000 accounts. By the end of Q1 2018, all 3,509 customers who should have been on a tracker will be redressed and compensated. Around 96% have already been completed. By the end of Q1 2018, all 939 customers incorrectly charged a higher margin for a period of time – most impacted by less than €500 according to Byrne – will be redressed and compensated. 81% have already been completed. In December 2017, a further 4,900 customers were added to AIB’s scheme. 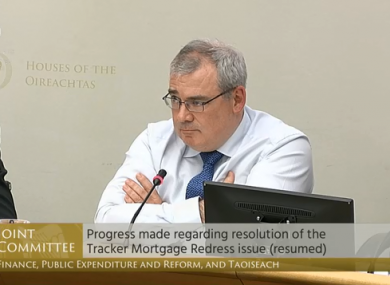 Byrne said by the end of Q1 2018, the customers who were never on a tracker mortgage – around 4,000 accounts – but who could not avail of one because it was withdrawn, will each receive compensation of €1,000 plus €615 towards independent advice. By the end of Q2 a further 900 customers will be reverted to their own tracker rate and will be paid back and compensated. Byrne said AIB is “deeply conscious of the adverse effect that this issue has had on impacted customers”. Many people are angry as a result of the treatment they encountered and I apologise again for this on behalf of the bank. “AIB’s culture and reputation can only stand on the foundation of fair treatment for the customer. Where we fall short of this standard it undermines our values and the credibility of the bank,” Byrne told the committee. Email “Tracker mortgage scandal: AIB did not consider 'the potential fallout' ”. Feedback on “Tracker mortgage scandal: AIB did not consider 'the potential fallout' ”.